Do you ever want eggs for breakfast but want them fancy but don't want an omelette? Well every now and then I get that feeling, so I decided to make these! I just took out a lot of half used items I had took the ones that sounded good for breakfast and made these off the cuff. The key to these really tasting great is to make sure you buy some nice and moist smoked salmon and keeping it that way. You do not want it to dry out or they will just taste horrible. So I made sure to soak the salmon so when I cooked it on the eggs it would stay moist and tasty. Enjoy! Tear salmon into pieces and place into a small bowl, squeeze 1/2 of a lemons juice over salmon, sprinkle cayenne, cumin and both paprikas over salmon and mix well. Let soak until ready to use. Mix both cheese together in a small bowl and let sit until ready to use. In a large skillet heat butter over medium heat. Once melted spread out jalapeno, green onion and garlic and cook for 1-2 minutes. Form four even half dollar size piles of garlic in your skillet evenly spaced apart. Break an egg over the center of each pile, pierce the the yolk of each egg and sprinkle a pinch of essence over each egg (you do not have to pierce the yolk, I just like to on these eggs.) 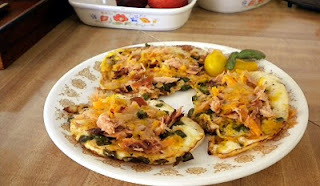 Cook for 1-2 minutes, then flip, sprinkle with pepper and salt, top each egg with 1/4 of the salmon mixture and then spread 1/4 of the cheese over each egg, cover and continue to cook for an additional 1-2 minutes or until cheese has fully melted. Serve hot with a little ketchup or sriracha sauce, enjoy!